Hi, I’m Abbey, a 21 year old undergraduate student at York St John University. As my second year comes to a close, there are only a few weeks before I enter my third and final year of university. This comes with a scary realisation that my student bubble will soon burst and I will have to get a real adult job. There are a couple of reasons I chose to take a work placement opportunity. One, the obvious, is that there is an increasing number of graduate students who struggle to get onto the career ladder after university, thus having some experience under my belt would stand me in good stead for when it’s time to start applying for those jobs. However, more importantly, I knew it would give me a chance to get a feel for the job, to learn what someone would do in the role and, fundamentally, to see if it was something I would like to pursue upon graduation. I chose to send a speculative application to Pick & Mix Marketing as their range of clients appealed to me. I was also attracted to the fact that they were a small team as I hoped this meant I would get a wider range of jobs. I was offered a place with them after I attended a sort of informal interview and was more than happy to accept. I was excited by the idea of working with a company who have a diverse range of clients and do a variety of marketing such as social media marketing, print marketing and content writing. They also offered me a cup of tea as soon as I arrived for my interview (winner!). 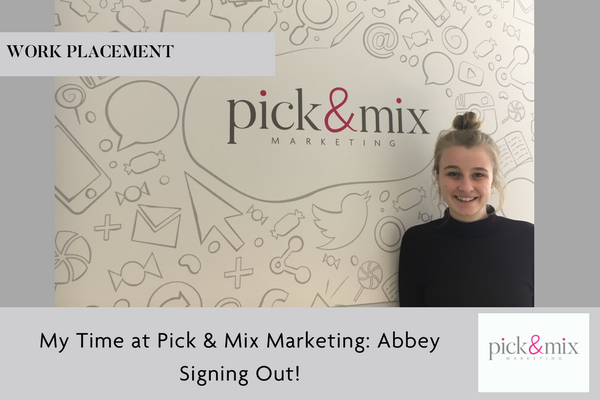 During my time at Pick & Mix Marketing I had a range of responsibilities such as research, identifying opportunities for new content, social media growth and engagement and writing posts for social platforms such as Twitter, Facebook and Instagram as well as a couple of blogs for clients. I also attended my first ever meeting! Obviously, some of these tasks were more fun than others, but each one of them proved to be a valuable experience as I learned different things from each one and gained a broader perspective about what social media marketing is all about. As a creative writing student I, naturally, enjoyed the content writing the most and I quickly adapted to transferring my writing style from post to post which, ultimately has made me more confident with my writing abilities. My work placement at Pick & Mix Marketing far exceeded my expectations. Not only have I learned more than I thought I would about social media marketing in just fifteen days but, also about what the working world is like. I have learned the values of working in a team, how staying curious can turn even the not so fun jobs into an opportunity to learn everything you can and, that if you keep discussing it for long enough, someone will get the biscuits from the kitchen! I couldn’t have asked for more off Sally, Jess and Louisa… they were welcoming, friendly and made me feel like part of the team from day one. In terms of whether I am still considering a career in marketing, the answer is yes. I have thoroughly enjoyed my time here and am eager to discover more about the marketing world.